Earlier this week, I delivered work to the Children’s Museum of New Hampshire for the show Driven to Abstraction which will run through then end of February. It was fun because several of us came at the same time, so we all got a chance to catchup and see some of the work that would be in the exhibit. This is a colorful show and lots of fun. And this is a great place for an exhibit of abstract art. Children are much more accepting of art in all it’s forms. They seem to be less likely to get caught up in the kind of questions that adults often ask such as – what is it? what does it mean? I think children are more likely to just look at it and enjoy it. If you’re in the area, please check out this exhibit. Tess Feltes, curator for Gallery 6, always does a fabulous job of selecting and hanging the art. And if you have children, even better. Look at the art through the eyes of a child and enjoy it just that much more. These are my pieces which are included. Last week I attended the Meet & Greet at the Children’s Museum of New Hampshire. Because winter is a tough time to have a normal reception, they opted instead for a meet & greet for the artists, their families & friends. It was great fun. We toured the exhibit as a group and got a chance to hear what artists had to say about their own work. I was surprised both by how many artists were able to attend and also by how many of the artists I already knew at least casually. It was fun to have the time with the other artists. Thank you to Tess and the museum staff for arranging it. Again, I’m excited to be included in an exhibit at the Children’s Museum of New Hampshire. This exhibit is titled “What is Home?”. They always do an excellent job of selecting interesting, quality and diverse artwork exploring their theme. You’ll see work in a variety of mediums and styles all exploring the idea of home often from very different perspectives. 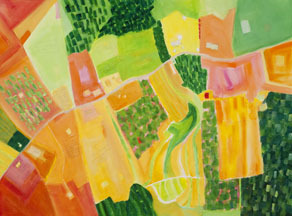 Two of my “Hollis Land Project” paintings are included. 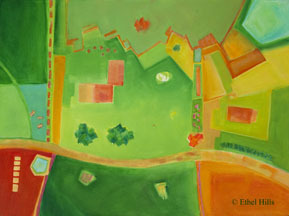 These paintings explore issues of home, family, land, neighborhood and include both family history and local stories. The paintings are a bit like treasure maps. Larger blocks of color and line indicate houses, boundaries, roads and water and landscape features. Smaller marks indicate favorite trees, patches of flowers, and even a few cows. Both paintings have little bits of family and neighborhood history and stories written into the paintings. Many of these are still clearly visible in the painting “Our Street”, whereas most of the writing is almost totally hidden in the painting “Home on Pine Hill Road #1”. If you were doing a similar painting of your home, what would your marks indicate? Maybe there is a low spot that is loud with the sound of peepers in the spring or the tree you climbed as a child or the shrub near a window where robins nested every year. Maybe there was a small garden, a chicken coop or a dog house? What are your memories that are tied to a specific place, a specific piece of land, a specific building, a specific tree or pond? Ethel Hills - "Our Street" - Watercolor - 22" x 30"
Yesterday I went with a friend to see the watercolor exhibition at the Currier Museum of Art in Manchester, NH. “From Homer to Hopper: American Watercolor Masterworks from the Currier Museum of Art” is up through June 7th. For watercolor artists, this exhibit is a real treat. It draws primarily from the Currier’s own collection and includes many of the artists we associate with watercolor, Andrew Wyeth, Edward Hopper, Charles Burchfield, Charles Demuth, John Marin, Childe Hassam, Arthur Dove and Winslow Homer. It also includes several artists I didn’t recognize and several I associate more with other mediums. With six more weeks, there’s plenty of time for me to go back for another look. When I go to an exhibition like this there are two things that I do. The first one is very human, interesting, but not particularly useful. I always have to ask: “If I could take one painting home with me, which one would it be?” Sometimes the answer is obvious, sometimes it requires a great deal of thought and sometimes I just give up because it’s too hard. From this exhibit, I think it would have to be the Charles Demuth painting “Roofs and Gables”. I fell in love with Demuth’s paintings when I first started painting in watercolor, so I suppose it’s not surprising that I would choose this small painting from among all of the works. The second thing is that I always try to pick up an idea to bring back to the studio. Sometimes, I do this systematically, by making lots of notes and sketches. Other times, I just try to pay attention. If I pay attention when I go through an exhibit, then the ideas are there when I get home. One image that has stuck in my head is “Visitors” by Mark Tobey. I just love the way the white marks play against the reddish-brown background of this piece. I’ve just started to work with brown paper in my collages, so perhaps that’s the connection. There were several other pieces that are painted on brown or colored papers. Something to think about. Yesterday I had a wonderful treat. I saw the exhibit “Collage: Piecing it Together” at the Portland Museum of Art in Portland, Maine. It included examples from their collection as well as items lent by contemporary Maine artists. Luckily my husband went off to a lecture in another part of the museum and I had a full hour to myself with these wonderful pieces of art. I’ve only been doing collages for a bit over 2 years and I have a lot to learn. I tend to spend a fair amount of worry over the technical issues, looking for a thinner paper which is still acid free, trying to determine which type of glue or medium will work best, or is watercolor paper a solid enough foundation, that sort of thing. Looking at these beautiful collages really reminded me that the technical issues are just such a small part of the story. Almost all of these works challenged my assumptions in one way or another. One beautiful piece was glued to a piece of corrugated cardboard. Another piece included quite a bit of newsprint. Another appeared to use brown paper that might have come from a paper bag. Some included fabric and other materials as well as paper. Other pieces included printing techniques. Some used brightly colored paper which resembled construction paper. A couple of pieces showed the ridges where one piece was glued over another. All of these are technical issues which I’ve considered in my own work. And I guess, really, the technical issues are really just little things. The important thing is the final look of the piece. These pieces of art challenged my own aesthetic in all sorts of ways also. One piece was so simple, just a few shapes cut from tans and blacks. Others had almost machine precision to them. Some pieces looked casual, like they had been put together very easily. Others were very complex. Some were extremely energetic and others were quiet and subtle. Some were large, but my favorites were small. Some were quite colorful and others had only very subtle variations of hue. There is something or some things for me to learn from this exhibit, but it may be a while before I figure out exactly what. Unfortunately, today was the last day for the exhibit so I won’t be able to return for a second look. I do however have all of my notes. And I also have several artists to look up. More on individual artists at a later date.